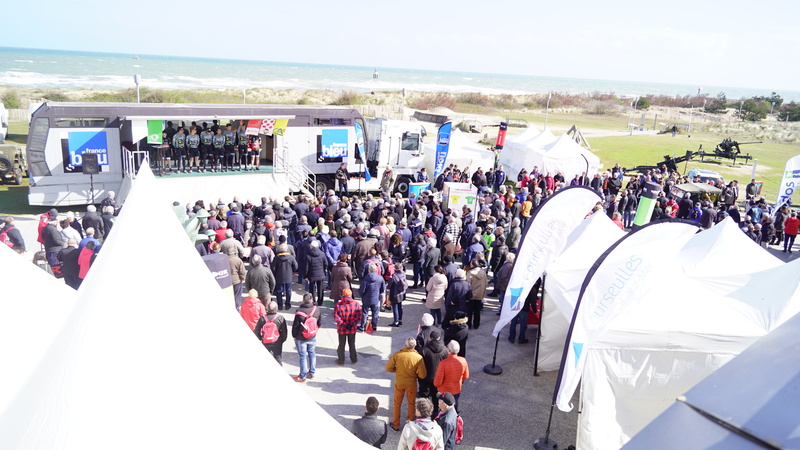 The 2019 Normandy Cycling Tour left the Juno Beach Centre on March 25! It is in front of Juno Beach, at the Juno Beach Centre, in Courseulles-sur-Mer, that cyclists from around the world started their 7 days long race. “For the 75th anniversary of D-Day in Normandy, it was important to leave from the landing beaches,” said Arnaud Anquetil, President of the Tour of Normandy. The departure village gathered many enthusiastic people, who came to enjoy the start of the race but also the many free activities. There was oysters from Courseulles, Norman biscuits, tourist information, safety road tips… School students participated an activity on the theme of cycling. The Juno Beach Centre proudly presented the Canadian products of the boutique including maple products. Good race to all participants of the Tour of Normandy! Good luck to all the organizers and volunteers and a big thank you from the Juno Beach Centre for choosing our museum in Courseulles-sur-Mer as a starting point. And let the best win!